Perched on a table with a line of liquor bottles, with two of his early paintings (including Target with Four Faces  and Target ) behind him, the young Jasper Johns (b. 1930) turns his gaze toward the camera. His frank stare and slightly slouched posture, along with the cocktail in his hand, telegraph an unmistakable mid-century cool. This portrait of a young artist casually pausing for a drink might be read as a straightforward (if perhaps staged) document of Johns at the dawn of his celebrity. It may also be interpreted as tacit acknowledgment of the intimacy between photographer and subject. 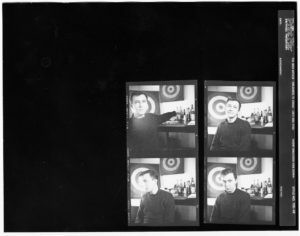 Robert Rauschenberg had first met Johns, who was five years his junior, in New York during the 1953–54 holiday season. Shortly thereafter, the two began a deep intellectual, artistic, and romantic partnership that lasted until 1961. Jasper—Studio N.Y.C. (1958) dates from an incredibly fertile period when Johns and Rauschenberg, working from adjacent studios in Lower Manhattan, were furiously trading in themes, motifs, and ideas. Here the lettering on the labels of the bottles—NOILLY PRAT, MYERS’S RUM, BEEFEATER—hints at the privileged role that text, typography, and printed materials played in both artists’ work during this era. Jasper—Studio N.Y.C. was taken at 128 Front Street, where Rauschenberg and Johns relocated their respective studios to the second and third floors in March 1958, after their former building on Pearl Street was condemned. Just before the move, Johns had garnered considerable acclaim in the art world. 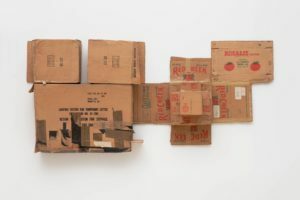 Late in 1957, he had met prominent gallerist Leo Castelli, who upon encountering the flags and targets filling the young artist’s studio immediately offered him a solo exhibition (January 20–February 8, 1958). 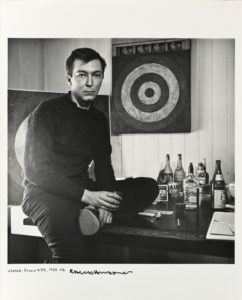 In January 1958, Target with Four Faces (seen here hanging behind Johns on the Front Street studio’s distinctive paneled wall) was featured on the cover of ARTnews magazine; one of four paintings from the Castelli show to be acquired by the Museum of Modern Art, New York, it continues to be recognized as a signature work by the artist. This photograph was likely made shortly after Johns moved to Front Street, when the painting returned to his studio briefly so that he could create a shipping frame. Rauschenberg: Photographs, Douglas Elliott Gallery, San Francisco, September 13–October 28, 1983. 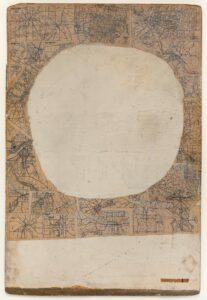 Rauschenberg Fotografia (Florence: Archivi Alinari, 1981), n.p. (ill.). Rauschenberg Photographe (Paris: Centre Georges Pompidou, Musée national d’art moderne, Editions Herscher, 1981), n.p. (ill.). Robert Rauschenberg Photographs (New York: Pantheon Books, 1981), n.p. (ill.). Mary Lynn Kotz, Rauschenberg, Art and Life (New York: Harry N. Abrams, Inc., 1990), 91 (ill). Whitney Chadwick and Isabelle de Courtivron, eds., Significant Others: Creativity and Intimate Partnership (New York: Thames and Hudson, 1993), 188 (ill.). Nicholas Cullinan, Robert Rauschenberg: Photographs 1949–1962, ed. Susan Davidson and David White (New York: Distributed Art Publishers, 2011), 207 (ill.). Robert Storr, Selections from the Private Collection of Robert Rauschenberg (New York: Gagosian Gallery, 2012), 186 (ill.). Catherine Craft, Robert Rauschenberg (London: Phaidon Press Limited, 2013), 21 (ill.). Note: This photograph was inscribed in the 1980s. Inscribed date of 1955 does not conform to recent research by the Robert Rauschenberg Foundation, which dates the photograph to 1958.